On 9 August 2018, Gaza theatremaker Hossam Madhoun was chatting with friends a little more than fifty yards from the city’s Al Mishal Cultural Centre. One friend, who had just returned to the area, asked where his theatre and performance could be produced in town. The beautiful and well-equipped Red Crescent Society, perhaps? Madhoun had to remind him it had been bombed by the Israeli Army during the military offensive on Gaza in 2008. The friend then asked about the theatre at Holst Cultural Center. At that moment the sound of a bomb shook the building they were in. It was still daytime, but the sky was black with smoke. Moments later Madhoun and his friends learned it was the Al-Mishal Cultural Centre that had been destroyed. The creative and social uses of the Al-Mishal Cultural Centre were far-reaching within Gaza, and the space was known throughout Palestine as one where beautiful performances and profound community engagement took place. What happened to the center during and after the bombing has brought an international focus to an ever-growing problem: the sanctioned, consistent, and unwavering destruction of Palestinian culture by the Israeli government. The current plight of artists in Gaza is even more desperate since the 9 August bombing: while they lacked space and safety to make work before, circumstances have grown even bleaker with the loss of this vibrant center for arts and culture. Production of War and Peace at Al Mishal Cultural Center in Gaza. The first time I went to the West Bank was to teach theatre in the Jenin refugee camp for Freedom Theatre. I didn’t know back then how deeply the culture would affect me, how often I would want to journey back, and how I would feel the area’s blows from my home in New York, thousands of miles away. Both my work and my life were changed as a result of my interaction with the Palestinian people and my growing knowledge of the oppression, injustice, and tragedy occurring with brutal consistency. When I heard of the bombing of the Al Mishal Cultural Centre, I literally doubled over in pain. I didn’t know what to do, but I knew I had to do something. The current plight of artists in Gaza is even more desperate since the 9 August bombing: while they lacked space and safety to make work before, circumstances have grown even bleaker with the loss of this vibrant center for arts and culture. My reaction was mirrored by dozens of theatre practitioners. Upon hearing the news, the late Elyse Dodgson, former international director of London’s Royal Court Theatre who was a friend of Mohana, was shocked that no British paper reported on the bombing and wanted to support artists in Gaza. Similarly, Jonathan Chadwick, the artistic director of London’s Az Theatre who had just co-produced the world premiere Arabic stage adaptation of Tolstoy’s War and Peace with Madhoun’s company Theatre for Everyone, immediately wanted to take action. The British theatre community rallied, coming up with a campaign and publishing a letter of condemnation for the violence in the Guardian. As awareness picked up, I was asked to join the cause. Alongside the ASHTAR Theatre, Yes Theatre, and Freedom Theatre, and people like Madhoun, Mohana, Chadwick, Iman Auon, Shalva Wise, and Caryl Churchill, I have been working, through my involvement with the H.E.A.T. Collective and Theatre Without Borders, to increase interest in and build awareness of the Al Mishal Cultural Centre—its history, its present, and its possible future—through the Gaza Cultural Centre Campaign. The community of international theatre practitioners who have come together to condemn the bombing is growing, and we are seeking the recognition and support from even more artists around the world. As we call for justice we are simultaneously researching the best ways to rebuild this cultural hub. Gaza’s isolation as a result of Israel’s blockade and restrictions has ravaged its economy and impoverished its people. Many in Gaza live in a state of unemployment, without sufficient water or electricity. The conditions endured by the residents have been seen by human rights organizations as a violation of international humanitarian law. The Al Mishal Cultural Centre was a five-floor building that housed a performance space as well as offices, a library, a café, and a recreation center for children. It offered many cultural events, including theatre, dance, and music, to the population of Gaza City. It was the headquarters of the al-Anqaa’ (the Phoenix) dance troupe and provided open spaces for performances and trainings for cultural organizations in the Gaza Strip. It represented an important symbol of Palestinian cultural identity, heritage, and freedom of expression. 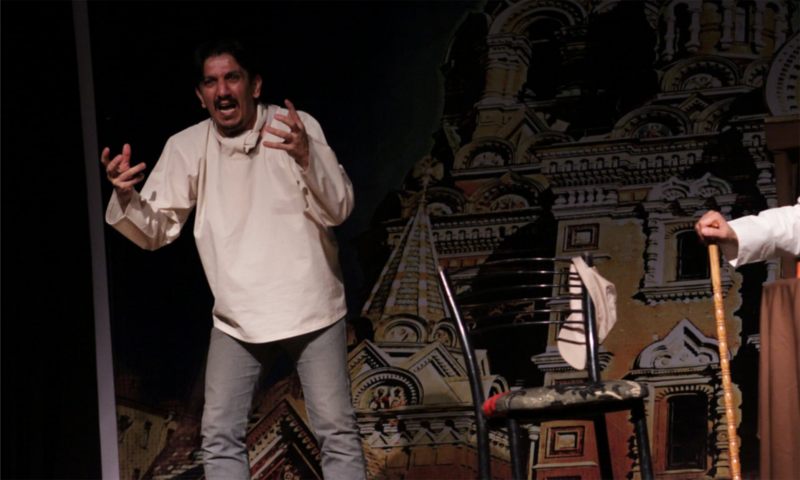 On 9 August, actors and crew had been preparing for an evening performance at the Centre. The air was alive with the electric theatrical energy that occurs before the opening of a project that people have been working on for months. At some point during the day, residents in the area received alerts, which came in the form of phone messages and warning shots fired by the Israeli army, that an attack was coming. These warning shots, or “knocks” as they became known to locals, were typical occurrences in Gaza before an attack. No one knew, though, where the bombing would happen. Two hours later, when the cultural center was razed to the ground, the community was shocked. No one knew, though, where the bombing would happen. Two hours later, when the cultural center was razed to the ground, the community was shocked. Cultural centers are vital to communities—they can be lifelines for isolated citizens. The teachers I worked with at the refugee camp in Jenin once told me that the only place students felt free to express themselves was at the Freedom Theatre. Even though violence is always present in Gaza—all night you hear gunshots close by—these individuals felt a sense of safety at the center, a place where heritage and family, art and music, gave them a certain amount of comfort and shelter from the gunfire and bombs. 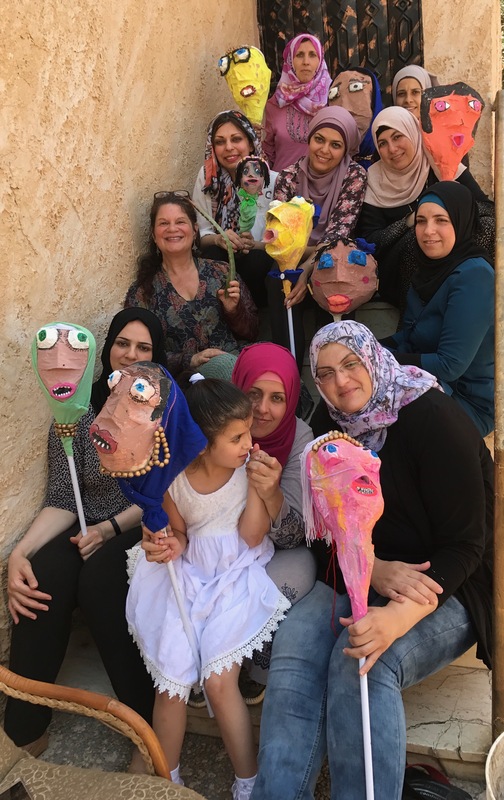 Jessica Litwak teaching puppet building in The West Bank. There are artists and civilians living in Gaza under siege who require safe space to gather and work. One of the most important and largest cultural spaces in Gaza was recently destroyed by Israeli bombs. Cultural centers hold deep importance to a wide variety of communities; artists need a cultural gathering place where they are free to express themselves with others. The international theatre community has expressed a huge amount of empathy and concern and willingness to help. Palestinians are warm, social people who are generous, resilient, and courageous. If we as an international community keep working together by using theatre as a weapon of peace and justice, if theatre people everywhere can be conduits for the message of liberation through action, there is a chance that justice will be served. I remember something a student told me in the West Bank: when the Israeli government outlawed flag-waving, Palestinian youth carried watermelons and smashed them on the ground. A broken watermelon is red and black and green—the colors of the Palestinian flag. Maybe, with the creative weapons of performance and physical metaphor, we can create the courageous generosity necessary to rebuild what is broken, and together we can keep imagining freedom for Palestine until it’s really there. Great essay, Jessica. I agree about the importance of the Cultural Center in Gaza. Iman and I discussed when I was in Ramallah in November. Where is the best place to make contributions? Thanks for everything you are doing!